CloudView is a standards-based network management and monitoring system (NMS). 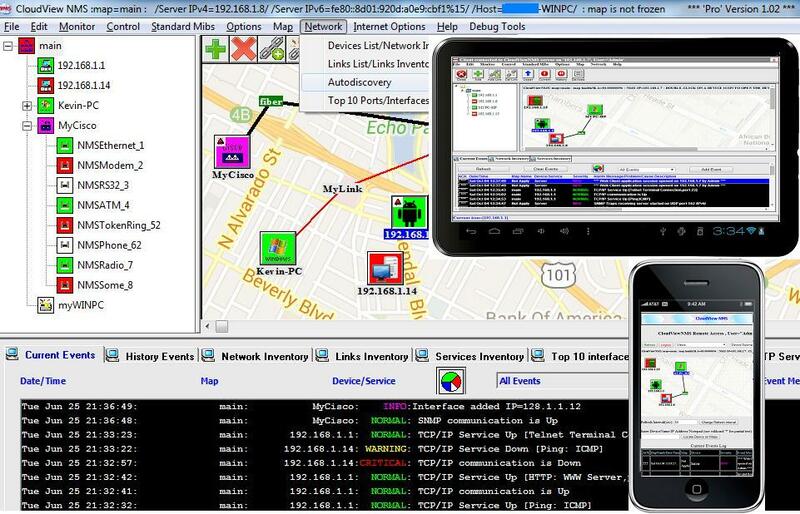 It can auto-discover, monitor and perform many functions with virtually any vendor SNMP or TCP/IP devices. It provides consistent geographical view of your whole network (thousands of IP nodes and hundreds thousands of switching ports), helps with its configuration, monitoring and troubleshooting. It is client-server system which allows secure performing NMS functions by multiple remote users simultaneously. CloudView can be successfully used in both enterprise and service provider networks with carrier-grade reliability. It is scalable for any network size. It is supported on multiple platforms including Windows, Linux, Mac OS and Solaris. It can be accessed remotely from any platform including mobile devices. Multiple network protocols standards are supported, including SNMPv1, SNMPv2 and SNMPv3 with AES-128 security. Our customers also successfully use CloudView in SCADA (supervisory control and data acquisition) solutions as a large scale industrial control system (ICS). When access to managed devices is blocked by a corporate firewall, network address translation (NAT) mechanism or manged devices do not have a permanent IP address (i.e. DHCP) , CloudView offers optional agent software which can be installed on the devices to overcome the above problems without VPN. Visit http://www.cloudviewnms.com for more details. HiliSoft MIB Browser Free Edition (Popularity: ) : A Powerful MIB browsing tool provided by HiliSoft. Support SNMP v1, v2c and v3. Support SMI v1 and v2. CloudView (Popularity: ) : A simple, almost zero configuration PHP Web UI API. Forget about HTML, CSS, or JS while developing, CloudView takes care of all those pesky details with it's object-oriented classes that represent your favorite HTML gadgets, hassle free! Just for Fun Network Management System (Popularity: ) : A Complete IP NMS that supports SNMP, TCP, Traps, Syslog, Tacacs+ and TFTP. NMS CGI Project (Popularity: ) : Secure, supported programs including formmail, guestbook and counters.